IFTN caught up with Irish director Lisa Mulcahy to discuss working on Virgin Media's drama 'Blood', female representation in the industry and her new feature film 'Undercliffe', which made its world premiere at the Austin Film Festival last week. 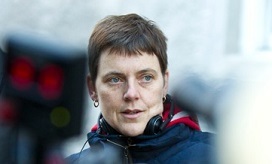 Lisa Mulcahy is an award winning Irish writer and director. Previous directing credits include TV dramas and documentaries such as 'On Home Ground', 'Raging Bulls', 'The Clinic', 'Dan Dan, Dad & Me', and 'The Moonstone'. Mulcahy's acclaimed first feature film, 'Situations Vacant', was released in 2009. In 2010 she directed 'Gift of the Magi', a film for The Hallmark Channel, and she then directed the short, 'Coming Home' in 2011. In 2015, Mulcahy won an IFTA Gala Television Award for her direction of the hit TV3 drama 'Red Rock', which also won Best Soap and The People's Choice Award on the same night. Also in 2015, Mulcahy wrote and directed the epic fantasy film 'The Legend of Longwood' which follows a 12-year-old New York girl who moves to a quaint village in Ireland, but soon discovers an ancient mystery about the Black Knight which haunts the town. Most recently, Mulcahy has worked on Virgin Media Television's new drama 'Blood' and new British feature film 'Undercliffe'. IFTN journalist Nathan Griffin caught up with Mulcahy to discuss the Irish drama, her new feature film and female representation in the industry. IFTN: Firstly, your new feature film 'Undercliffe' recently made its world premiere at the Austin Film Festival. How was the screenings and how did you enjoy the festival? Lisa: "Yes, it was great. The Austin Film Festival is a fantastic festival, particularly for screenwriters. It's really called the writers' festival. Although I didn't write this film, one of my next films, I am writing. I just took huge advantage of the many different seminars that are given by incredible writers and script editors and production executives. There is just tons and tons of stuff going on. You set a schedule for yourself and you literally go from one to the next, to the next, to the next, starting at nine in the morning, which was great. I saw some very interesting people at the various different talks, which was all very useful. I also saw some films that were in the festival and that was nice. "Our first screening was on a Friday evening. The Festival uses cinema spaces that are quite eclectic and small. They'll be like the church halls or where we were was a place normal used for improv. The film went down well. There was a Q&A afterwards, which was great. "The next screening was on the Monday at about a quarter past three during the day in a cinema chain, which was out of town. I didn't expect really there to be many people there but in fact there had been a very good review for it in the Austin Chronicle that obviously bought people out. We had another Q&A after that and everybody was very positive and the response it was really enjoyable. It was great to see the film on a really good screen with really good sound in a full cinema." IFTN: How did the opportunity to get involved with this project come about? Lisa: "I had made a BBC series, a period drama called 'The Moonstone', which is completely different, so different to 'Undercliffe'. One of the writers of 'The Moonstone' is a woman called Sasha Hails and Sasha's partner is a theatre director called Dominic Dromgoole who used to be the artistic director of the Globe Theatre. When he finished his tenure there, he started a production company to make feature films." "Dominic had seen my work, and obviously he had spoken to Sasha about it so he approached me, gave me the script and said, 'Look, I'd love you to do this if you like the script.' I read the script. Such a nice script, it's so well written. It was a page- turner from beginning to end. I said to him, 'Yes, I'd love to' He said, 'All right, let's do it.' It was all very quick, once I read it and said yes." IFTN: What are the next steps in terms of bringing 'Undercliffe' to a wider audience? Lisa: "Austin is the first festival it's been in. I don't know how much word-of-mouth goes from festival to festival, but Harrison, who was the programmer at Austin, loved the film so I said, 'Please spread the word because I'd love this film to be shown elsewhere.' We don't have a sales company but we have two salespeople who are working on the film to try to promote it elsewhere. It's been submitted for Dublin (VMDIFF), but I don't know if it'll get accepted for Dublin, and we'd obviously love it to get shown in the UK as well. I'm hopeful that there'll be more screenings because it would be great just for it to be out there and be seen." IFTN: You have also recently worked on 'Blood', Virgin Media Television's new drama series that is currently airing internationally. It's great to see another Irish drama being produced. How important was the commissioning of this Irish drama and how was your experience working on it? Lisa: "It's great to be working at home for one! Apart from anything else I have a young family, so it was great. It's the first time I have worked at home in two years. Also, to be working on such good writing, that's ultimately what any director wants to do. You want to be working on really great scripts. That was a fantastic opportunity to be working here for six months on such a good project, which seems to have been very well received from any of the reviews I've read. "Kind of deservedly so in a way is because Sophie's writing, you would really be failing miserably if you had made a bad job of that. It's great to see, Sophie spent all her summers here when she was a child so she had always written this for Ireland. It wasn't something that she had written for England and then changed it to over here. Hopefully there will be better drama being produced here by Irish writers and Irish directors and the broadcasters will get on board that. "The essential ingredient is good writing and so writers really need to be supported by the broadcasters in putting money into development. Some of the stuff that's come out of here recently hasn't been great and it's disappointing but there definitely is a pool of writers there. They just need support and encouragement from the broadcasters and from the film board and everybody." IFTN: Had you previously worked with Sophie on 'Red Rock' before? Lisa: "Sophie had written on 'Red Rock' but I checked back and I don't think I directed any of her episodes in 'Red Rock'. Yes, she's a young writer, she's not even 30, she's written for 'The Last Kingdom', she's written for 'Riviera'. She really is a talent and I'm hoping that she will write more stuff that's going to be set here, fingers crossed. Sophie was around the whole time when we were shooting and that was great. "She was always there if you needed her but she's not the sort of writer who's poking into your job all the time, which is just great for a writer that there's somebody there who's supportive but not overwhelming. I think she found the experience great. Virgin Media were fantastic they seemed enthusiastic the whole way through the process. For both Sophie and Jonathan Fisher, the producer, I think they just enjoyed working here and with all the crew and with the broadcaster. I know that they both would like to come back and work here again." IFTN: Can you give me some insight into what sort of rehearsal and preparation time you had prior to starting on the series? Lisa: "This would probably be pretty normal for a TV series, it's that you don't really get rehearsal time. I probably spent a day with Carolina who plays Cat. She came over to Ireland and we just spent a day together and we just talked through to the script. When you're talking, you go off on tangents, which is normal and I suppose you have conversations that are relevant to both of your life experience and the story. Myself and Carolina spent the day together. At that stage, I'd seen a couple of auditions and I'd met her in a call back. "Even when you are doing call backs, really you are starting to rehearse because you are getting the feel of an actor and what sort of a person they are. Then, when she came back, and before we started shooting, I had maybe probably three days' rehearsal where I would meet each actor individually and just talk through the script with them. Then I'd have meetings with actors in combinations, so I'd meet Diarmuid Noyes & Carolina together. They play brother and sister. We'd talk through their scenes together. As I say, I don't like to over-rehearse, just as long as I know that they have a grasp on the story that is similar to what mine is, I'm happy." IFTN: It's fantastic to see such a strong female contingent in the key HOD roles on the show. How important do you feel the recent shift towards gender parity on set has been in Ireland and how much has it changed since you started in the industry? Lisa: "Of course, it's really important that more women are getting to play their part, whether as directors or cinematographers, traditionally two areas that wouldn't have had huge representation from women. I don't know whether it's made any difference to me getting jobs. Of course, there are lots jobs I go for that I don't get so I don't know. In relation to cinematographers, I've seen lots more female names and that's fantastic. That was the first time I'd worked with Kate [McCullough] and she did a beautiful job, absolutely beautiful, and why wouldn't she? She's very talented. She was just the right person. We spoke with a number of DPs and we just felt Kate was the right person for this job. It's just an accident that she's female, if you know what I mean." IFTN: Agreed. It would obviously be ideal to reward a person on the merits of their abilities rather than their gender. But I am interested in your take on the recent initiatives to encourage female producers, directors and writers in Ireland. What have you made of the development as a whole? Lisa: "It's great! My big thing however is not only supporting women but also that the country should support women in more basic things like affordable child care. Just the fact that it is so expensive, it just stops women in every area of employment because it's so prohibitively expensive to have proper childcare. For me, it would be an enormous issue because I have three children that I have to care for as well as being able to work. That really needs to change and we are way behind so many other countries on that level." IFTN: Finally, you alluded to it earlier that you are currently writing your next project. Can you tell us a little bit about that? "I'm also attached as director to a script that has been shortlisted for the Screen Ireland, POV. That's very exciting. That's just at a script development stage and they will announce the three recipients in March." The series finale of 'Blood' airs on Virgin Media One this Monday, November 12th at 9pm.